For the past few years I have edited a community magazine. One of the most memorable articles was one in which some children chose an item from within their house and used it as a jumping off point to explore their family history. Research has been done recently to show that children who know stories about their relatives and ancestors tend to show higher levels of emotional well-being – that knowing your family history gives you a greater sense of self. Not only that but children whose parents shared with them stories of their family history were more able to deconstruct and retell more complex narrative structures at a later date, as well as act with more empathy. Teens who had a clearer grounding of self-identity and family history were better able to deal with depressive and anxious thoughts if and when they occurred. Some children can ask an elderly relative for their life story. For many others, whose older relatives may have died, moved away, or who are unable to share stories – it can be really hard to know where to begin. Books that help children and families to start the exploratory process are as follows. Published 5th March 2015, this handbook aims to inspire and assist the entire family in discovering and preserving their family story. More blank spaces than filled in spaces, it’s designed so that you utilize it both as inspiration and as scrapbook or blank canvas to begin your journey. It includes quotations, and ideas. Some of these are really quite clever – introducing the family tree as a series of ‘ever-increasing’ circles rather than a traditional box and line drawing, favourite meals rather than just passed down recipes, pictures that hung in your childhood home rather than just old photographs, catchphrases that relatives said. It also contains all the traditional methods too. I liked that it wasn’t too big – it had lots of ideas but didn’t leave me with so much blank space that it was a daunting or intimidating task – rather a series of small manageable tasks that I could easily accomplish. 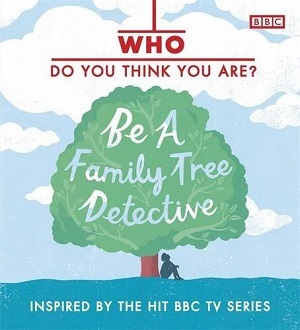 Inspired by the BBC TV documentary series in which celebrities explore their family histories, this is for children to explain to them the rudiments of genealogy. Before you even start, there is a pull-out family tree to fill in – visually set in a tree – with boxes stretching from yourself at the bottom to your great-great grandparents on all sides. The book then guides you through the genealogy detective process from what happened on the day you were born, to who your grandparents are, definitions of useful jargon such as heirloom, gene, census etc. It gives tips on how to interview family members, deciphering the stem of names, looking at old photos, utilising a paper trail, and how to present and preserve information. Visually the book is crammed full with information, but is colourful and presents much information in small boxes or lift-the-flap pieces. There are numerous articles on using the Internet and how to find your way to the best sites, and these are clearly picked for their longevity – the ones I looked at seemed to be safe and still running, and where they charge a fee, the book does point this out. I particularly enjoyed the illustrations of a man suffering his grandparents regaling of past history, and the Weird Names section, including a particular Mary Louise Pantzaroff. The text is chatty without being patronising, and gives good advice on the topic. All in all, it’s easy to use, and I recommend this to interested children. If your older children are interested in family genealogy, the younger ones might get fidgety and want some attention too. 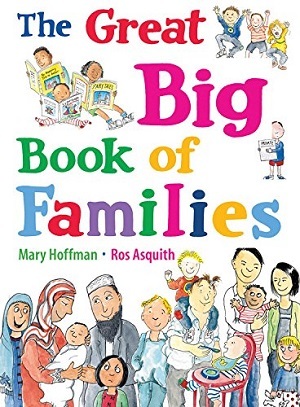 Mary Hoffman’s 2011 book is a neatly politically correct book explaining what families are and how they come in different guises. 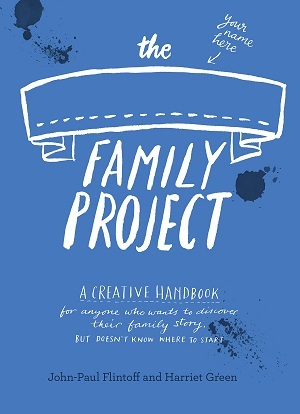 My first feeling is that it is of course inclusive and every school would want to have a copy to explore families without leaving anyone out or upsetting any child – for example the first few pages explain that some families have a mum and dad, some have just one, some have two mums, some children are fostered etc. The illustrations are cartoonlike, and the characters are fairly expressive, but it works more as a teaching device than it does a picture book to enjoy. It talks through where different families might live, what they celebrate, what they eat, how they travel etc. There’s a cat to find on every page, which makes it more interactive, and it encourages making a family tree towards the end. It’s an interesting book, and especially useful in school libraries. One picture book which exemplifies the anecdote with which I started this blog is The Matchbox Diary. An American picture book, it tells the story of a conversation between a little girl and her grandfather. The grandfather shows the little girl his matchbox diary – a box filled with matchboxes each containing a small item that highlights an element of his life story of immigrating to America from Italy. He couldn’t read or write so his diary was small items kept in matchboxes. Throughout the book it becomes clear that the smallest items – an olive stone, a tooth, sunflower seeds – can tell one man’s life story. It’s a long book – not a picture book for the very young – but one for older children to explore a part of America’s history, as well as use it to discover how history can be recorded in oral traditions and through artefacts. The sepia toned artworks to illustrate the grandfather’s memories of the past are exquisite. It’s an interesting story, well worth exploring, particularly as part of a classroom discussion about the past, or as a family exploration of recent history and immigration. Thanks to Faber and Walker publishers for sending review copies of The Family Project and Who Do You Think You Are? respectively. With thanks to Emory psychologists Robyn Fivush and Marshall Duke, former Emory graduate Jennifer Bohanek, the paper “Do You Know? The power of family history in adolescent identity and well-being”, as well as Bruce Feiler, The Secrets of Happy Families, and Elaine Reese, Professor of Psychology at the University of Otago in New Zealand.